Welcome to Electoral Vote Predictor 2004. 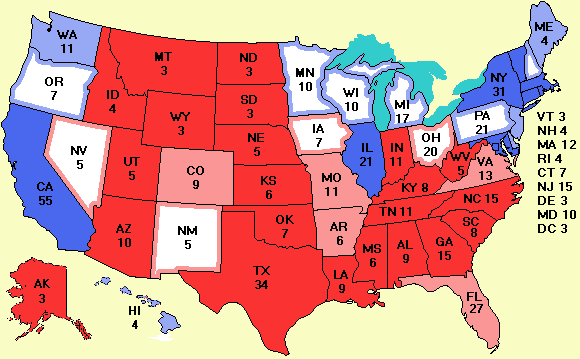 From May 24, 2004 until Nov. 9, 2004 this site tracked the state polls for president and presented a daily map of the projected electoral college based on those polls. It also tracked the U.S. Senate races and provided a wealth of other information relating to elections and politics. All of the information is now available for researchers to examine. The Welcome page is a good place to start. You can also start with this map and go back in time by clicking on the Previous report link to the right of the map. If going backwards in time makes you dizzy, you can start at May 24. A great deal of additional data is available on the More data page. You are also encouraged to examine the other links on the menu below the map. To all my loyal visitors over the past half year, thank you for visiting. As this election cycle is winding down, there probably won't be many more updates unless something fairly unexpected happens. I will keep the site alive until at least the end of 2008 so the large amount of data here will be available to researchers, pundits, bloggers, and others during the next four years. Other than the cost of the hosting and domain name registrations, and the occasional bit of hate mail, there is no real downside to making all the data semipermanently available. If there are any university researchers in political science who want to mine the log, let me know in a week or so when everything has calmed down. There were 42 million hits to the HTML pages, so there is quite a bit of data. See the Hits from universities page as an example. Will I do this in 2006 or 2008? Time will tell. Once again, thank you for all your ideas, suggestions, help, and support and goodbye for now.